Dental implants from Cary Family Dental can permanently restore a missing tooth, with a replacement that looks and functions like a natural tooth. In the past, if someone had a missing or severely damaged tooth, the best options were dental bridges or dentures. 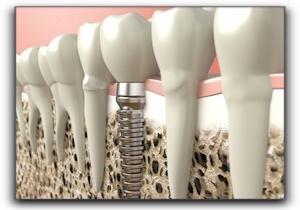 These days, dental implants have proven to be superior. Seamless – Fabricated to have the same shape, size and color of the original tooth, the implant will blend seamlessly with all the other teeth. If the original tooth had aesthetic issues, these can typically be fixed with the implant crown. Convenience – Unlike dentures, no adhesives, rinsing, or removal is necessary. A dental implant is a titanium post that is surgically placed in the patient’s jaw. A single implant can support one artificial tooth, while multiple implants can support a set of dentures. It’s no wonder that implants have been hailed as one of the greatest advances in dentistry. Cary Family Dental offers single and multiple dental implants. Call our office to schedule an appointment today.